“Miles Burton” is one of the two major pseudonyms of Cecil John Charles Street, MC, OBE. John Rhode is perhaps his best-known pseudonym, under which he wrote about forensic scientist Dr. Priestly, and he also wrote as Cecil Waye. As Miles Burton, the series characters are Inspector Arnold and Desmond Merrion. Well-known critic and author Julian Symons called this author “a prominent member of the Humdrum school of detective fiction”; “Humdrum” is a label applied to a group of writers who were thought (at least by Symons) to be competent but relatively boring. For a much more nuanced and complete assessment, I’ll refer you to a fellow Golden Age Mystery blogger who is probably the world’s expert on Street’s work: Mr. Curtis Evans. Mr. Evans’s assessment of Street’s work can be read in this fascinating volume, and I encourage you to purchase a copy for yourself; he reviews a number of other such novels at his very interesting blog, The Passing Tramp, and I also recommend that to your attention. 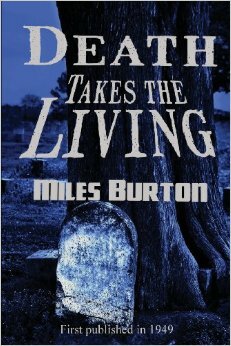 Mr. Evans reviews other Miles Burton/John Rhode novels in his blog but not this one. He has given a great deal of time and effort to understanding Major Street and his work (as well as that of Freeman Wills Crofts and A.W. Stewart, who wrote as J.J. Connington; I’ve reviewed a Connington novel here). So if you’re looking for in-depth insight about these writers, start with Mr. Evans’s work. (And it’s from his blog that I’ve lifted the photograph of Street you’ll see in this post; my apologies, but that face was just irresistible.) As Mr. Evans elsewhere notes, Street had a huge output in his lifetime; about 143 mysteries in 38 years. Perhaps it is this prolific quality that encourages critics to view his work as formulaic work, churned out at the rate of about four novels a year. I confess that before I encountered his work in some depth, I merely absorbed the wisdom of other critics who dismissed the entire Humdrum school, but Curtis Evans’s enthusiasm and scholarship have led me to approach these novels with a fresh eye. It is my practice to make the first illustration in a post the cover of the edition which I actually used for the review. In this case I found the book online here, at Blackmask Online (Munseys.com), and thus was unable to do so. Munseys asks me to say that the book is available for noncommercial use under CC 3.0 and I am happy to do so. I am indebted to ClassicCrimeFiction.com for the cover art of the first edition you will see here. Classic Crime Fiction is an excellent bookseller whose holdings include many scarce mysteries, with a strong focus on British writers. The site is informative and useful and I recommend it to your attention, especially if you are looking for a particular volume you’ve been unable to find elsewhere. I haven’t troubled to obtain their permission to show you the cover art; I trust that my attempt at steering you to them for your purchases will allow them to forgive my minor misuse of their property. Representations of the jacket art for this volume are hard to come by and they have just about the only one available. The first four chapters of this novel chronicle the quotidian activities of The Reverend Jonathan Denby, who has lately been demobilized from the RAF after serving as a chaplain in the Middle East. He calls upon Bishop Kinghorn to obtain a post that will allow him to indulge his interest in early Saxon history. Bishop Kinghorn was also the headmaster of Denby’s public school (and also that of Denby’s cousin Henry, who is now a Cabinet minister). The Bishop suggests that Rev. Denby would suit the living of the remote village of Clynde, a poor rural district, the living of which is controlled by Lord Mundesley. There are problems; first is that the stipend associated with the living is nearly nothing, two hundred pounds a year, but since Denby’s father Sir Ambrose has settled a generous amount upon him, this is not a consideration. The other major issue is that Lord Mundesley has been difficult to please with respect to the incumbent; he prefers to wait for just the right parson and leave the living vacant until that man is found. Oh, and the “rambling barrack” of a rectory is said to be haunted. Jonathan Denby meets with Lord Mundesley, whom we learn hates the politics of cousin Henry; Lord Mundesley comes from trade, and Henry is apparently an elitist. However, Rev. Denby makes it clear that he dislikes his cousin’s political career as well. Lord Mundesley is a friend of Sir Ambrose, and thus reluctantly agrees that Jonathan shall have the living. He tells Jonathan that the vicarage is unfit for habitation and tells him peremptorily that he’ll be living at a house Mundesley owns in the village. Jonathan has other plans, but doesn’t mention them to anyone; he obtains the key to the vicarage from a local woman and intends to camp out there until he can make the place more habitable. Jonathan feels that he doesn’t want to be quite so much under Mundesley’s thumb as to accepting his house and intends to present the lord of the manor with a fait accompli. He moves a camp bed and some basics into the deserted vicarage and is awakened in the middle of the night by some noises, which he goes to investigate — and that is the last we hear of the Reverend Jonathan Denby. In fact, the cleric’s body is found floating in the ocean in Chapter 8 and this kicks off the real action of the book, after a very, very leisurely opening. Sir Ambrose identifies the body and Inspector Arnold embarks upon an investigation, with the help of his friend Desmond Merrion, who lives in the vicinity. (These are Burton’s two series characters.) Merrion is of a level of society at which he knows some of the people, including Lord Mundesley — who invited him to a day’s shooting some years ago. Sir Ambrose announces that he will devote his considerable fortune to finding out who killed his son … and almost immediately is found dead, apparently of a heart attack. WARNING: You’re about to learn the complete solution to this mystery, which may well destroy any interest you have in reading it. Please don’t proceed unless you are content with that idea. I’ve left out the activities of the central portion of this book because they are, essentially, pretty boring. There is nothing wrong with anything that happens in this section, it’s merely the basic activities of the police procedural. Inspector Arnold and his friend Merrion trace down leads, investigate clues and slowly but surely build a picture of what’s happened. It may well be that Burton’s devotees — and I’m sure he had many — found this material delightful. Since it was already reasonably clear to me what was going on, approximately what had happened, and who was responsible, I have to say I found it fairly boring. And so I merely skimmed this middle section and pretty much jumped to the end to learn that, yes, I’d been right about everything and the solution was almost exactly as I’d forecast it. Essentially what’s happening here is that there are two plots going on simultaneously. In the main body of the book, Lord Mundesley is a wealthy man but he is running a criminal operation that’s been using the deserted vicarage for storage of stolen goods. It’s not clear to me precisely why he’s doing this; he doesn’t need the money, but it seems as though he likes to keep his hand in the managing of a business whose basis is sharp practice. (He’s said to have made his money by selling patent medicines, which I understand at that time were frequently useless preparations taken more for the placebo effect than anything else.) His minions were engaged in clearing out the vicarage, unaware that the reverend was spending the night; a brutish lorry driver kills the reverend and then the gang goes to a great deal of trouble to get rid of the body and conceal their activities. Inspector Arnold and Desmond Merrion soon penetrate the criminals’ activities and bring home the crime to its perpetrators. The lorry driver is condemned to death and Lord Mundesley gets five years’ imprisonment. When the Cabinet Minister, cousin Henry, learns of the death of Jonathan, he determines that he’s going to inherit Sir Ambrose’s entire fortune and wants it quickly, so he poisons Sir Ambrose with aconitine. When Henry learns that the jig is up, he poisons himself to avoid arrest and disgrace. I have to say that the only dubious point for me was whether Henry and Lord Mundesley had been working together; we are told explicitly in the early chapters that Mundesley dislikes Henry, so my only puzzlement was whether this was meant to be true or whether Mundesley was lying to conceal their mutual involvement. In fact, the two plots were unconnected and Mundesley was telling the truth about his dislike of Henry. In the final paragraph of the book, the Bishop preaches a sermon that essentially said that both of these powerful criminals got what was coming to them. As I suggested above, although I have a considerable familiarity with the body of detective fiction, the full breadth of the Humdrum school has pretty much escaped my attention. Part of the reason for this is that, generally speaking, these volumes are difficult to obtain, being both scarce and expensive. Major Street wrote about 143 mysteries; I have to say that in my long history, marked by an assiduous attention to tracking down books and authors with whom I was unfamiliar, I may have read fewer than 20 of them. And the only one that I remember with any degree of clarity is the book he wrote in partnership with “Carter Dickson” (John Dickson Carr), Drop To His Death (aka Fatal Descent); I’ve read everything Carr ever wrote, mostly with great pleasure, and this was no exception, so I ascribed my pleasure to Carr rather than Rhode. When I worked behind the counter of a mystery bookstore, any used copies of John Rhode novels which happened to cross my desk vanished into eager hands within a week, sometimes without my having had the chance to read them before departure; Miles Burton novels were almost always completely absent from my stock. So, unlike many different sub-genres of detective fiction, Humdrum practitioners like Major Street have been largely unknown to me — and, I venture to say, to most of my readers. There are a reasonable number of Freeman Wills Crofts novels available, but John Rhode/Miles Burton not so much. I can’t honestly say that I know the Humdrum School in the same breadth and depth as I do, say, the locked-room mystery or the police procedural or the comedy mystery. In fact, my opinions are bound to be shallow through lack of experience and I will be looking to read a lot more of these books before I feel I can make any authoritative pronouncements; that’s why I’ve tried to steer you to the well-informed thoughts of Curtis Evans. That being said, I have to say I enjoyed this book a lot more than I thought I was going to. Yes, as I have confessed above, the solutions to the crimes were really quite obvious to me almost from the point at which they were described. However, that has happened in a number of different instances, partly because I’ve read so many thousands of mysteries that I’ve grown accustomed to the way that writers’ minds work when trying to fool the reader. So I don’t regard this as a drawback. 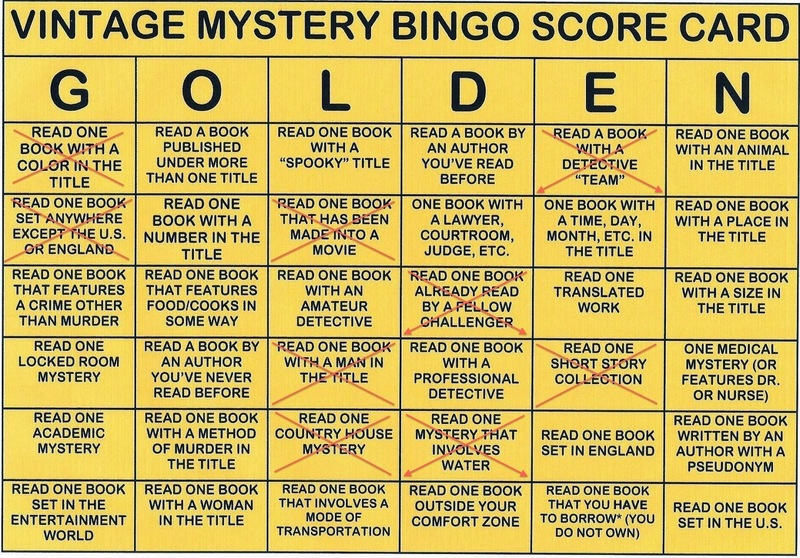 I actually enjoy re-reading a good mystery for the pleasure of the writing, so it’s not really the “thrill of the chase” that draws me to a book. One of the things that does contribute to my enjoyment of a mystery is the way in which it is embedded in a time and place; social context, if you will. And here is where I really did find a great deal to enjoy. There are many, many things in this book that are not written down that underpin its actions that have to do with the time and place. For instance — the denomination of the Reverend is never specifically mentioned. That’s because the author, everyone in the book, and everyone in its natural audience understands that the only church is the Church of England. Major Street would never have bothered to mention this, in the same way that he would not have bothered to explain that Scotland Yard had nothing to do with Scotland. In the Humdrum school, other denominations of religious organizations are looked upon with suspicion, and “heathens” and the like are prime suspects wherever they appear. Similarly, when Lord Mundesley is presented as having come from a background in which he actually sold things for money (“from trade”), the audience is meant to understand that this makes him the social inferior of a gentleman such as Sir Ambrose, because he is a “life peer” rather than the hereditary scion of a long line of Denbys. It’s also not spoken, but understood, that Lord Mundesley has an interest in keeping on the good side of Sir Ambrose for social reasons, and thus would find it difficult to refuse a clerical living under his control to the son of Sir Ambrose. There are many more things that would have been much more clear to the British reader of 1949 than they are to this Canadian of 2014. I’m not precisely sure, for instance, what is being said when the well-born Desmond Merrion mentions that he was invited some years ago to Lord Mundesley’s for a day’s shooting — but doesn’t mention ever returning. Was Merrion snubbing Mundesley? Was Mundesley snubbing Merrion? Was this some kind of inchoate social outreach effort on Mundesley’s part that met with polite acceptance, but no enthusiasm for a return engagement? Since Mundesley turns out to be not only a counter-jumper (look this up, it’s a fascinating turn of phrase) but a criminal, perhaps Merrion was merely exercising good judgment. There are many such fine, fine gradations of social class and background in this book, particularly in the opening chapters. The point is that the levels and gradations of the post-WWII British social experience were obviously Major Street’s milieu and that of his natural audience, and his command of those gradations obviously met with the approval of his audience. I’ll suggest that the British reader of 1949 wished to be confirmed in its opinion that some Lords were no better than they should be, and that Scotland Yard always got its man, and that low-class charladies were rarely thieves but made good honest witnesses, village bobbies were out of their element with complex crimes, et cetera. And that this was accomplished by reading books in which these concepts formed the basis but were not really spoken aloud. What was really going on was that the correctness and durability of the long-established social order was being affirmed. The other reason I enjoyed this novel was because of its writing, which seems a little paradoxical. 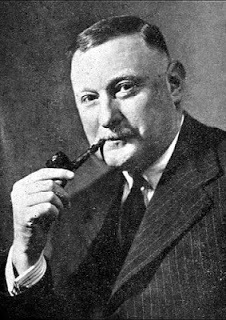 Major Street was not known at all for skill at writing, but rather at plotting; Symons and other critics suggest that he was something of a utilitarian writer, just good enough to get the job done. And yet I kept thinking, as I read, of Hemingway. Believe me, I have not lost my grip on an ability to judge prose; it’s simply that Hemingway made few words say a lot, and so, in his own way, did Major Street. There is little extraneous prose here, and little in the way of description. Yet Street managed to make seven very slow chapters at the beginning of this book catch my attention; I liked the character of the Reverend and wanted to know more about him, and was somewhat discouraged when he turned out to be the victim. I enjoyed the way in which the writer created the social milieu against which the actions took place, and I even found that Street had something of a flair for writing dialogue that revealed character. I can’t say that this is deathless prose that will survive through the ages; it didn’t even attract the attention of a publisher for a paperback edition, which says a lot, given their endless quest for inexpensive fodder. But I enjoyed this novel’s attempts to amuse me in a mild, bloodless way, and I am sufficiently encouraged to go look for more of the same. I think you might be too. The first edition (Collins Crime Club, 1949) is available in two states, one better than the other, from Abebooks for £40 (about $68 US); a second edition was offered for £29. 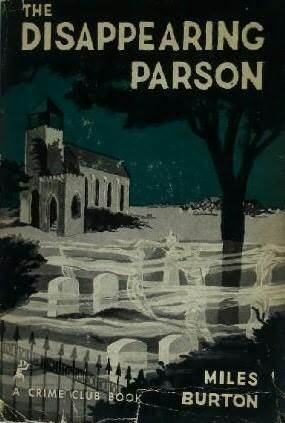 I was unable to find any copies of The Disappearing Parson available for sale. This does seem to be a scarce book but not absolutely unobtainable; since a reading copy is available for free on the internet as noted above, it’s only collectors of this specific writer who will be interested in this novel, I suspect. In that case, my general advice is to buy a copy of the first edition in the best condition you can find. 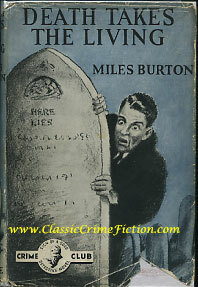 This 1944 volume qualifies as a Golden Age mystery; fifth under “D”, “Read one mystery that involves water.” The titular victim (the disappearing parson of the US edition) is found floating in the ocean and the events of the plot involve considerable activity at sea, involved in the transportation of stolen goods. For a chart outlining my progress, see the end of this post.